a fitting - and impressive - end to a life which has changed the world forever. You have a gift, sir. Very well told. Now I'm going to have to read the whole damn thing again! Hey Robbie! Clearly you're a man of wit and discretion; you're my kind of audience ;> Happy to deliver, even if it does consume me for weeks (like this one) on occasion. Hey Alistair! Next? You want to know what's NEXT?! A long lie down, I expect. And a return to core competencies. *thinks* Sorry, no, that's at the office, isn't it? 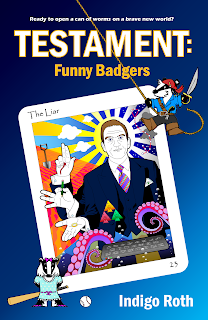 Short tales, silly drawings, cunning photo-hackery and funny badgers. Perhaps more of adorable young Dantoo at some point, too; we need more girls in these tales. Wish I understood 'em. Ah, yes, more of the lovely and oddly barefoot Abbey, indeed! (I've either missed or not read back far enough to see the origin of that eccentricity). A great end to the story, and not too long at all, when laced with such interest and intrigue. I believe Eolist described it all best in "Fitting". By the way, I am at last seeing what you are doing with who gets what colour dialogue. I am slow, I know. Also, that wouldn't be Helios rising at the end there, would it? Now before this comment gets any more rambly, I shall go. ~Cheers! Thanks for the kind words matey! There finally seems to be some momentum on comments after a couple of nervous days. "Interest and intrigue" I can live with, as I feared "long and self indulgent". There is no origin for Abbey's footloose and shoeless nature; she just does it. 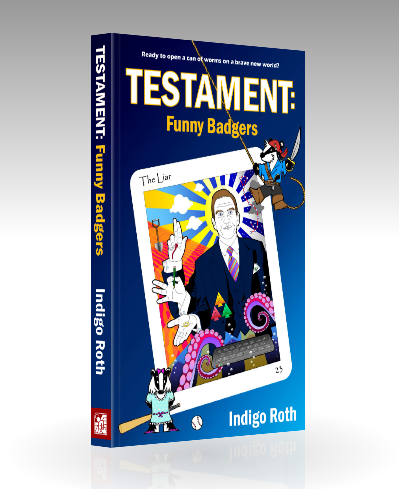 I suspect it may be badger related, but it honestly wasn't planned that way; these characters have a life of their own. I really must add her to my 101 page, as she's shown up a number of times now. But HELIOS RISING? Look, don't go getting all Nietzsche on me. I'm of no particular philosophical persuasion, with perhaps the exception of Courteous Deferentialism; Hobbes (or even Calvin) could kick Nietzsche's sorry arse any day. Anyway, best sign off - it looks like I'm more rambly than you, Sir! This is an amazing piece of work, my friend. I was truly transported. I can't even imagine what it took to concoct this tale. Certainly talent vastly beyond my own. Congratulations. It's really quite wonderful. Hey Jayne! Thank you, I'm very proud of it, so it's amazing to hear that it hit the spot. It's been a long and peculiar road to get here, but that's another story. Hey BoomBoom! As one of my longest-standing and loyalest followers (through thick and thin), I'm delighted that this tale delivered for you. Just for that, I'll write some more. And again, you tell a tale of wonder! I love your stories man, keep doing what you do!